Established in 1931, the Gemological Institute of America, or GIA, is the world’s foremost authority on diamonds, colored stones, and pearls. It is dedicated to research and education in the field of gemology. Through the development and dissemination of its policies, the GIA attempts to protect all purchasers of gemstones, by providing the education, laboratory services, research, and instruments needed to accurately and objectively determine gemstone quality. One of the GIA’s more visible services is provided through its GIA Laboratory which provides diamond grading services to describe the characteristics of loose diamonds. 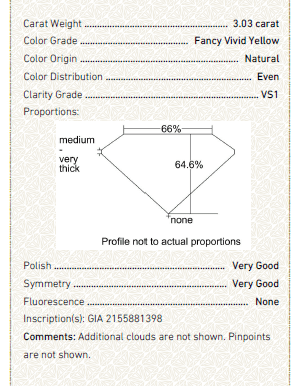 The most comprehensive report issued by the GIA for fancy color diamonds is the GIA Colored Diamond Grading Report . This report is considered an important tool in guaranteeing that a diamond is accurately represented to a potential buyer. Key to Symbols, GIA Clarity Scale, GIA Colored Diamond Scale, Proportion Diagram, and Security Features (of report to ensure authenticity). As an optional service, a full color image of the diamond may also be included. Color Distribution (evenness of color). Please note that GIA only recently began allowing one to verify a "GIA Colored Diamond Identification and Origin Report" (Color Only report) in the GIA website, here. This This service is currently available for all GIA Grading reports issued after January 1, 2000. If the report is dated after July 1, 2010, a PDF version of the report is available to view or download. The GIA Colored Diamond Grading Reports are not issued for synthetics, simulants, mounted diamonds or those that have undergone unstable treatments, such as fracture-filling or coating. Any evidence of other treatment is prominently disclosed in the report. The GIA color grading system for colored diamonds is used worldwide and has been applied to many of the most famous colored diamonds, including the Blue Hope, the Dresden Green, and the Hancock Red. When a diamond is inscribed with the report number, this provides irrefutable and eternal evidence that the diamond purchased is the diamond documented in the report. This not only assures security when purchasing a fancy color diamond but is a major selling point when wanting to sell that same diamond. The GIA’s imprimatur, as certified by an accompanying GIA Colored Diamond Grading Report, ensures that a decision to invest in a fancy color diamond can be made with peace of mind. The foremost experts in the world have assessed the relevant diamond on an objective basis and determined its characteristics. This is achieved in a transparent and homogeneous manner in the best equipped laboratories, allowing confidence when purchasing a diamond. In a previous article - GIA Certification of Colored Diamonds – background was provided of the Gemological Institute of America and the GIA Colored Diamond Grading Report. This report should be an integral part of buying a color diamond as it affords buyers the security and peace of mind that they are buying a stone that has been objectively appraised by one the most reputable authorities in the diamond industry. This series of articles is intended to further educate buyers on how to fully utilize and analyze the plethora of important information provided in the GIA Color Diamond Grading Report. A logical, in-depth description of the fields in the report is provided to further enable buyers of color diamonds to make an informed purchasing decision. 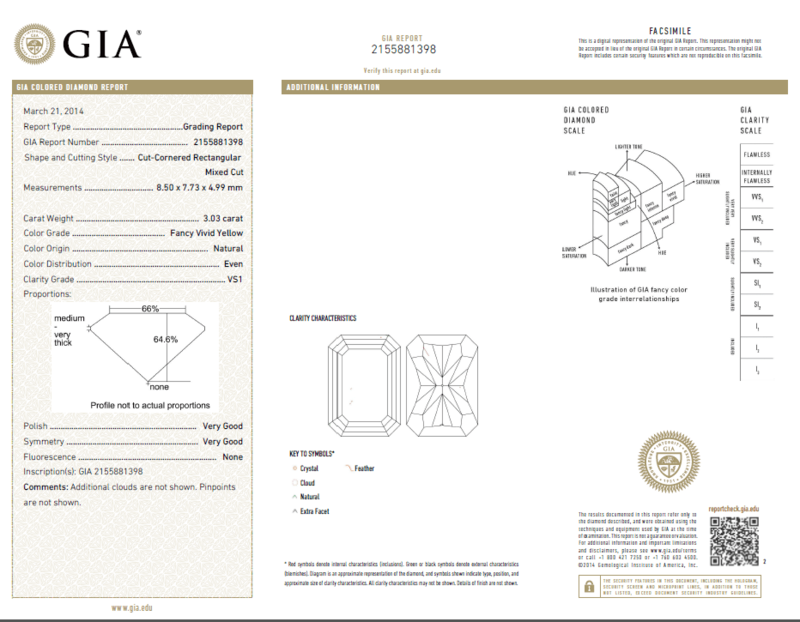 Below is a copy of a GIA Colored Diamond Grading Report. This document will now be described in a format that will enable a user to best utilize the information contained therein. General information about the GIA is displayed across the top of the report, including the GIA letterhead, address and contact details of the GIA Laboratory where the report was prepared, list of other GIA Laboratories, and GIA website address. • Date – this refers to the date when the report was printed not when the stone was graded. In the sample above, the date is May 06, 2010. • Shape and Cutting Style – this describes the outline of the diamond, i.e. its shape and the pattern in which the facets have been arranged, i.e. cutting style. In the sample above, the shape is Cushion and the cutting style is Modified Brilliant. The shape of a diamond describes the outline of its girdle, and includes: Round, Oval, Radiant, Asscher, Marquise, Princess, Emerald, Pear, Heart, and Cushion. This list is not extensive as with today’s advances in laser cutting equipment specific cuts are made by companies which are licensed under their own brand names, for example the Hearts On Fire Diamond and the Asscher Cut. 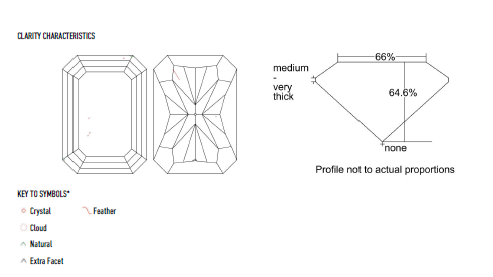 The cutting style of a diamond describes the type of faceting and includes: Brilliant Cut where the facets are shaped like triangles and kites; Step Cut where the sloping, four-sided facets are cut below the table and run parallel to the diamond's girdle; Emerald Cuts are step cuts with their corners clipped off; and Mixed Cuts which include faceting elements from both the brilliant and step cut techniques, either side by side or in different areas of the gemstone – this is a very popular technique for color diamonds. • Measurements – dimensions, in millimeters, of the diamond rounded to the nearest hundredth. For a round cut stone, the measurement is “minimum diameter – maximum diameter x depth (culet to table).” For fancy-shaped diamonds, the measurement is “length x width x depth (culet to table).” In the sample above, the measurement is 6.74X 5.82 x 3.70mm. • GIA Report Number – the vertically displayed number on the left-hand side of the document is the unique diamond identification number. The laboratory keeps an internal copy of all data on this report and it is cataloged according to this number. In the sample above, the GIA Report number is 1126068331. • Laser Inscription Registry – not displayed on our example, an option available to the buyer of a diamond is to have the GIA Report number inscribed on the diamond by micro laser. 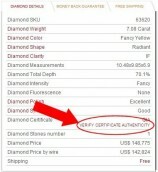 This is irrefutable proof that the diamond described in the report is the same diamond purchased. In a previous article - GIA Certification of Colored Diamonds – background was provided of the Gemological Institute of America and the GIA Colored Diamond Grading Report. This article is the 2nd section of the GIA Colored Diamond Grading Report, User's Guide and should be an integral part of buying a colored diamond as it affords buyers the security and peace of mind that they are buying a stone that has been objectively appraised by one the most reputable authorities in the diamond industry. • Carat Weight – diamonds are weighed in carats. A diamond’s carat weight is measured to the nearest 1/1000 of a carat but rounded to the nearest 1/100 of a carat. A carat equals 1/5 of a gram.In the sample above, the carat weight is 1.22 carats. This means that the carat weight fell in the range of 1.085 – 1.089 carats. Color– information pertaining to color is classified according to Origin, Grade, and Distribution. Origin – states whether the diamond’s color is natural or treated. Occasionally, it will be impossible to ascertain the origin of color, in which case the diamond will be reported as “Undetermined.” In the sample above, the origin is natural. Grade– one of the more complex categorizations for color diamonds, color grade is a combination of hue, saturation and tone. Hue refers to the color, saturation to the intensity of the color, and tone to the shade. Hue – this is the dominant color of the diamond, i.e. pink, green, red. A maximum of four hues can be listed under a diamond’s color. There is generally acknowledged to be 27 hues of fancy color diamonds. Saturation – this is the strength or intensity of a diamond’s color. Logically, strong saturation results in a richer hue and vice versa. If the stone has a dark color tone, the saturation can vary from dark to deep. If the stone is light in tone, the saturation can vary from pastel to vivid and intense. In the sample above, the grade is Fancy Intense Yellow. Tone – this describes how light or dark the stone appears to retain when illuminated – the higher the tone, the darker the color. Tone ranges from very light to very light or dark to very dark. Distribution – this refers to the evenness of distribution of color throughout the diamond when viewed face-up using standard viewing procedures. The greater the distribution, the better. Distribution is categorized as “Even” – symmetrical in over 50% of the stone, “Uneven” – asymmetrical in over 50% of the stone, or “Not Applicable” for the grades faint, very light, and light. In the sample above, the distribution is Even. Clarity Grade – this assesses the relative absence of inclusions (internal characteristics) and blemishes (external characteristics) of a diamond. There are 11 clarity grades on a scale from the highest grade of Flawless (FL) to the lowest grade of Included (I – graded on a scale of 1-3, with I3 being the lowest). Clarity grade is based on the size, nature, number, position, and relief of characteristics visible under 10x magnification.In the sample above, the clarity grade is VS1 the second highest grade after Flawless. A copy of the Clarity Scale is provided on the report (see Scale References). Finish – information pertaining to finish is classified according to Polish and Symmetry. This is the value added to the diamond by the cutter and his art. Polish – this is the overall condition or smoothness of the diamond’s surface, i.e. how carefully the stone has been polished and whether any surface imperfections are sufficient to affect the clarity grade. Polish is assessed according to five levels on a scale from Excellent to Poor. In the sample above, the polish is Very Good. Symmetry – this is the proportion of the diamond’s outline as determined by the shape, placement, and facet alignment. Two types of symmetry are considered – proportion symmetry and facet symmetry. Facet Symmetry – this refers to the shape, placement, and presence or absence of facets. Symmetry is also assessed according to five levels on a scale from Excellent to Poor. In the sample above, the symmetry is Good. Fluorescence – this measure is deemed to be of little value when assessing the value of a colored diamond and used mainly for identification purposes. Fluorescence measures the strength and color of a diamond when viewed under short or long-wave ultraviolet light. Fluorescence is assessed according to five levels from “None” to “Very Strong”, with “Strong” and “Very Strong” being less preferred. In general though, pink diamonds have a stronger tendency to fluorescence than other colors. Consequently, a strong fluorescence grade for a pink diamond won’t adversely affect its value. This can be contrasted with yellow diamonds which have very faint or no fluorescence. Consequently, yellow fluorescence in a yellow diamond intensifies the stone’s color. This also applies to green and orange diamonds with matching color fluorescence. In the sample above, the fluorescence is None. Comments – include additional identifying features or characteristics not otherwise represented on the report but that the grader thinks is relevant. Following the Additional Grading Information is the Reference Diagrams. The reference diagrams include the Plotting Diagrams and the Proportion Diagram. The Key to Symbols is located below the plotting diagrams. The plotting diagrams, the two diagrams on the left of the page, render an approximate shape and cutting style of the diamond. Symbols indicate the type, position, and approximate size of a clarity characteristic. The Key to Symbols lists the characteristics and symbols shown on the plotting diagrams, if present. Table - the table is the diamond’s largest facet and is the large flat top of the diamond. The percentage figure for the table represents the ratio of the table to the diamond’s diameter. The method of calculation of this table differs if the diamond is round or fancy shaped. In the sample above, the table percentage is 64%. Girdle – the girdle is the outside band that runs around the entire outer edge of a diamond. It is the widest part of the diamond and separates the table from the pavilion. The girdle is graded according to eight levels from “Extremely thin” to “Extremely thick.” If a girdle’s thickness fluctuates, then two levels may be listed representing the minimum and maximum thickness/thinness. The girdle thickness is not a great determinant on the value of a stone, however, as a general rule, a thinner girdle is preferred; especially for round diamonds. In the sample above, the girdle is Medium-Thick. Pavilion – the pavilion is the lower portion of the diamond below the girdle. The height of the pavilion greatly contributes to the diamond's overall brilliance. It should not be too long or too shallow in proportion to the rest of the diamond. If it is, light is not “held” in the stone resulting in a duller looking diamond. It is measured by dividing the length below the girdle by the total height of the diamond. Culet – the culet is the very small facet on the pointed end of the diamond. The culet is graded according to eight levels from “None” to “Very Large”. If the culet is large or very large, it may be visible with the naked eye from the table, generally resulting in a decrease in value of the diamond. In the sample above, the culet is None. This is almost always the assessment. To assist people in reading the report, two scales are displayed – the GIA Clarity Scale and the GIA Colored Diamond Scale. GIA Clarity Scale – this scale displays the GIA Clarity grades and their relative positions in the GIA Diamond Grading System. The diamond grading scale is divided into six categories and eleven grades as displayed in the table below. FL – Flawless A stone that is completely flawless. This is an extremely rare find. IF – Internally Flawless A stone that has no internal flaws at all but does have surface flaws. Also, an extremely rare find. VVS1/VVS2 – Very Very Slight Inclusion A stone with very small internal inclusions. These inclusions can only be determined with a X30 magnification. VS1/VS2 – Very Slight Inclusion A stone with very small internal inclusions. These inclusions can be determined with a X10 magnification. SI1/SI2 – Slight Inclusion A stone that has slight inclusions that can be determined with a X10 magnification. I1/I2/I3 (P1/P2/P3) - Inclusion or Pique A stone that has inclusions most often visible with the naked eye. Inclusions of this level drastically bring down the diamonds value. 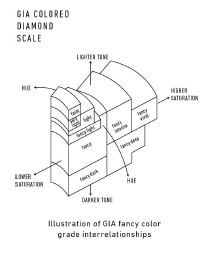 GIA Colored Diamond Scale - this scale (pictured below) displays the general interrelation of GIA fancy-grade terms, used to describe the combined effect of tone and saturation, in color space. The following terms can be used in the color grade: Faint, Light, Very Light, Fancy, Fancy Light, Fancy Intense, Fancy Vivid, Fancy Dark, and Fancy Deep. Displayed horizontally on the right-hand side of the report is a bar code. This is used for internal purposes to track the diamond and its progress through the GIA Laboratory during report preparation. This number differs from the GIA Report Number. Beneath the bar code is the GIA disclaimer followed by the GIA hologram - one of the numerous security features of the report that ensure the report is authentic and safe from forgery. Other security features include a security screen, micro-print lines, and chemical sensitivity. The GIA Colored Diamond Grading Report should be used by all potential buyers of a fancy color diamond as intended – an authoritative, objective, appraisal of the diamond under consideration. However, what should be apparent after reading this series of articles, is that there are so many subjective measures to consider when buying a fancy color diamond, that your perfect stone is out there waiting to be found.